Search thousands of MLS listings in the Boise and surrounding areas with our state of the art search engine designed to make the process as seamless, clutter and hassle free as possible. Whether you’re looking for a house for sale , a short sale , or are looking for a foreclosure to buy, you can start your search in the privacy of your own home by using our state-of-the art real estate search-engine. Our search engine is designed to make the process of finding Boise homes for sale as seamless and hassle-free as possible as you search through thousands of real estate listings in the Boise and surrounding areas. Homes for sale , houses for sale , short sales orforeclosures , you name it, if it’s Boise-area real estate you’re looking for, we have it listed on our site! Our team of local real estate experts is ready to guide you through the home-buying process. We are committed to fast, professional and courteous service to help you understand and feel at ease throughout the home buying process. Our trained and licensed real estate agents specialize in the Idaho area real-estate market and are prepared to find the right home and get the best price. Imagine buying the Boise Home of your dreams. We can help you make it happen! We are your House Hunters of Idaho! Boise, Idaho’s State Capital, is the most populous city in the state and is located in the heart of the Northwest. With easy access to the mountains of Idaho yet still boasting the urban distinction of a big city, Boise is by far one of the best capital cities to live in. 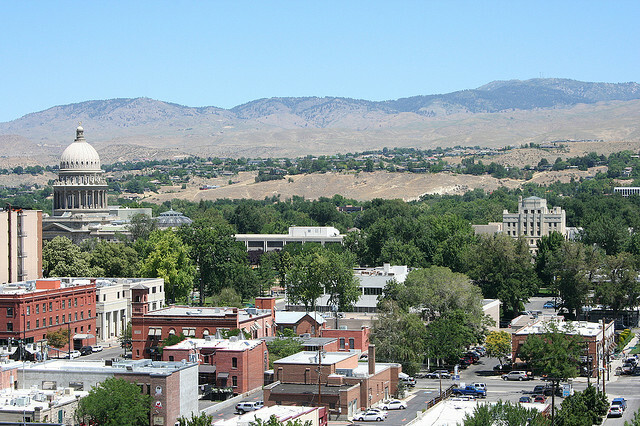 Boise, The City of Trees, is located in the Ada County Region of Idaho and is situated against the foothills of the Rocky Mountains with the Boise River running through the heart of the beautiful downtown. Home of Boise State University and the beloved Boise Broncos, this city offers a diversity of sights and activities, Among the many things to do, Boisians enjoy kayaking, biking, rafting, hunting and fishing, skiing, walking along the greenbelt and camping just to name a few. Downtown Boise (also known as Bodo) offers many unique museums and parks along with many venues for art, culture and history. Boise is proud to be touted as one of the best places to live, work, start a business; economic vitality among U.S. Metro areas and for the fastest growth of Green jobs, Boise has something appealing to offer everybody. Boise boasts a four season’s climate and a very low crime rate. Homes for sale in Boise offer a diverse variety of options along a very broad spectrum of pricing. With Boise homes starting below $100.000 and going up into the million dollar range, there is no limit to the amount of homes you can find as well as style. From new construction to historic homes, and from classic built to modern comfort, Boise has it. If you are hunting for homes and real estate for sale in Boise, Idaho, let HouseHuntersofIdaho.com be your guide. View new real estate listings in Boise from the comfort of your home. Hundreds of listings are updated hourly including foreclosures, short sales, condos, townhomes, estates and new construction. HouseHuntersofIdaho.com is your full service real estate team for homes and property for sale in Boise, Idaho and surrounding areas. House hunting should be a fun and professional experience. Let HouseHuntersofIdaho.com help you find your new home in Boise. Listings in Boise are added and change constantly, so please feel free to visit us as often as you can.